Joe Dawborn (right) receives a framed copy of the PT report on his 10-wicket haul from Dave Remnant. Peterborough Town professional Paul McMahon has agreed to spend a sixth season at Bretton Gate. The off-spinning all-rounder has played a key part in Town’s success in recent years. The former Notts professional and England Under 19 captain has taken 286 Northants Premier Division wickets in his five years at the club. McMahon’s presence is dependent on his work commitments. 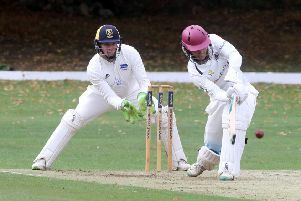 The legal eagle has been seconded to the ICC in Dubai for the winter and if the role becomes permanent he will have to quit Town, as well as his role as Cambs’ Minor Counties skipper. Lewis Bruce will stand down as Town skipper after three terrific years at the club’s annual meeting later this month. Opening batsman David Clarke is expected to be elected. As things stand Town expect to have the bulk of last season’s squad available next summer, although it would be a major surprise if paceman Joe Dawborn isn’t the subject of interest from elsewhere. Dawborn, who played for Leicestershire and Northants seconds last summer, was presented with the Town player-of-the-season award at the club’s annual dinner last weekend. Dawborn finished top wicket-taker in the Premier Division with 67 which included a 10-wicket haul against Brixworth and a hat-trick against fierce rivals Finedon. Dawborn was also presented with a framed copy of the Peterborough Telegraph report of his 10-wicket display. Dave Remnant, the last Town player before Dawborn to take 10 wickets in an innings in 1978, made the presentation. Other Town awards went to: Clubman : Paul Barker; Young Player : Connor Parnell; Sunday 1st XI Player-of-the-Year: Marcus Howard; Saturday 2nd XI Player-of-the-Year: Bob Milne; Sunday 2nd XI Player-of-the-Year: Ahsan Azhar; Saturday 3rd XI Player-of-the-Year: Sheeraz Ali. Elsewhere Burghley Park have joined the Rutland League for the first time. They will play in Division Three next season. Grantham, Spalding, Huntingdon, Long Sutton seconds and Orton Park seconds are other new teams to join the league. Eaton Socon, Stamford seconds, Barnack seconds, Bourne thirds and Warboys have all withdrawn from the competition which will run six rather than seven divisions next summer. The League have scrapped their Twenty/20 competition after just two years.